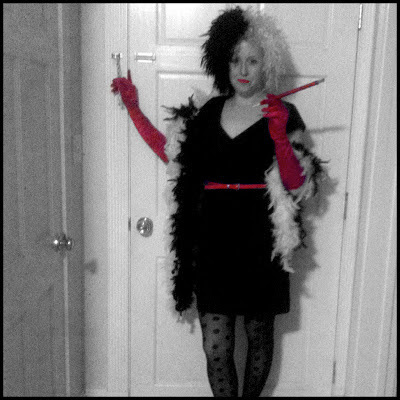 I decided to be Cruella de Vil for Halloween this year. I love the black + white costume, with hints of red. Plus, this look was easy to achieve. 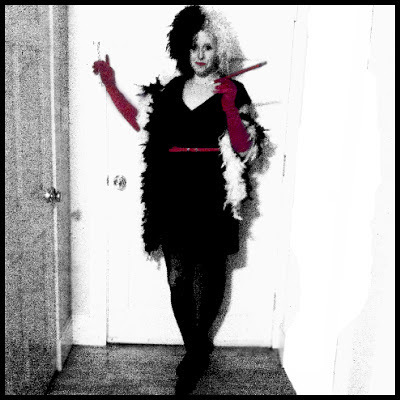 I purchased the wig, gloves, boas and faux cigarette holder at a local party store. The dress, shoes, tights and red lipstick I already owned. Happy Halloween! 4 comments on "Cruel, Cruel Cruella"
Yes, lets follow. Thanks, I'm always happy to have new followers. Oh wow, you looked amazing! That's such a great costume, and I was a HUUUUUGE 101 Dalmatians fan when I was younger! Found you through me + the moon's Friday hop!